Dr. Kenar Jhaveri Assistant Professor of Medicine shares diverse interests in post transplantation care of the recipients glomerular diseases and onco -nephrology(cancer chemotherapy related kidney disease). He has a special interest in innovative nephrology education and E-Nephrology and developing new teaching tools to enhance medical education. In his term here he has developed multiple teaching tools including games like crosswords anagrams in nephrology and he uses innovative teaching techniques such as role playing and concept maps to educate the residents and fellows. 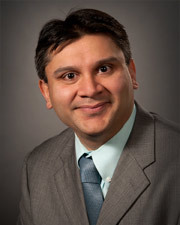 He has developed a nephrology blog for teaching purposes at www.nephronpower.com Dr. Jhaveri serves as the Section head of the Outpatient North Shore Nephrology clinics. "Has excellent patient relationship with high degree of compassion." "Dr. Jhaveri is the best in his field. " "I am very lucky as a cancer survivor to have Dr. Jhaveri as my doctor." "plain and simple, the BEST doctor I have ever met. Extremely satisfied with him and his staff"
"Doctor who understands his patients very well. A fine gentleman and a noble doctor." "I would highly recommend Dr. Jhaveri to anyone seeking a nephrologist. He is attentive, caring, and very thorough. He listens intently and is open to answering my questions about my treatment or concerns." "This dr. explained a lot about my concerns & all the medications I am taking. Excellent physician." "Dr. Jhaveri was professional but not cold. He did not speak down to me when explaining my issues. He used words I, as a non-doctor could understand, and he took the time to make sure I was comfortable with the finding & treatment." "An excellent doctor and decent human who is kind and gentle. Understands his patients." "100%. Dr. K. Jhaveri "
"I don't like going to dr.'s but Dr. Jhaveri always makes me feel at ease." "All was perfect. 8. 30 minutes. " "#1. Dr. Jhaveri, all of the above." "Was nice enough to call my daughter to explain the prescription list." "He expressed exceptional interest & care regarding my condition & is truly a wonderful physician." "We have decided to make Dr. Jhaveri our nephrologist. We have been using the same dr. for 30 years. We were so impressed with her care & knowledge. " "Dr. Jhaveri and on-call Dr. Hasan and one other on-call doctor who helped me were very good. I have great confidence in your staff." "I found Dr. Jhaveri to be very understanding of my fears, and he explained every thing in terms I could understand without talking down to me, as some doctors do. I really appreciate that." "I always have a list of questions to ask Dr. Jhaveri. He is always patient and addresses all of my concerns. I appreciate that he doesn't make me feel rushed. " "Dr. Jhaveri is caring, friendly and is excited about my good health." "Dr. Jhaveri is an excellent physician!! I would highly recommend to anyone who is looking for a nephrologist! He is extremely attentive, listens carefully, compassionate, and explains things _____ I fully understood." "Very impressed with the doctor." "I think Dr. Jhaveri is an excellent physician. He explains everything and take his time out to let me know what to expect when I have my surgery. Very kind!" "An excellent doctor who cares for his patients." "Very good experience by all providers." "I would definitely recommend my doctor to everyone I know with this medical condition. He explains everything to me and makes me feel very good about my ongoing condition and any questions I may have answered for me." "A very good experience !" "Very great. 7. Understand what was said. 8. Fair time. 9. Excellent. 10. Yes." "Dr. Jhaveri is extremely attentive, very concerned and has an excellent bed side manner. He is an extraordinary and exemplary physician." "Care provider was patient w/ me and smiled." "The best we had ever." "Doctor showed excellent listening skills and put us at ease with our concerns." "Wonderful, caring doctor in all ways." "Very friendly and concerned about my issues." "When Dr. Jhaveri gives me bloodwork he always calls the next morning with my results." "I am a retired RN and understood all the answers given to my questions the doctor did an excellent job." "All were so friendly & nice. I walked away with confidence we were going forward & learned more about my condition." "This was my first time with this provider. I found him to be very polite & did an excellent job."